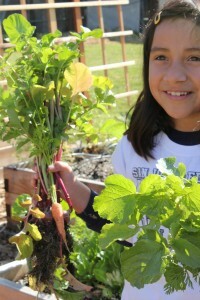 Most people, save Atlantic magazine’s resident contrarian Caitlin Flanagan, agree that school gardens are a good thing. They encourage experimentation, critical thinking and healthful eating. Done right, they raise parental participation in schools. At their best, they’re as cute as a third-grader grubbing for worms. Too often, however, teachers are defeated from the outset by the burden of installing and then maintaining a garden in addition to a classroom. Click here to keep reading about a workable new model for schools in “The Dry Garden” in the Los Angeles Times.